Gamification is often only associated with digital (online) games. However, this is not enough. Gamification can use digital media, but does not have to. 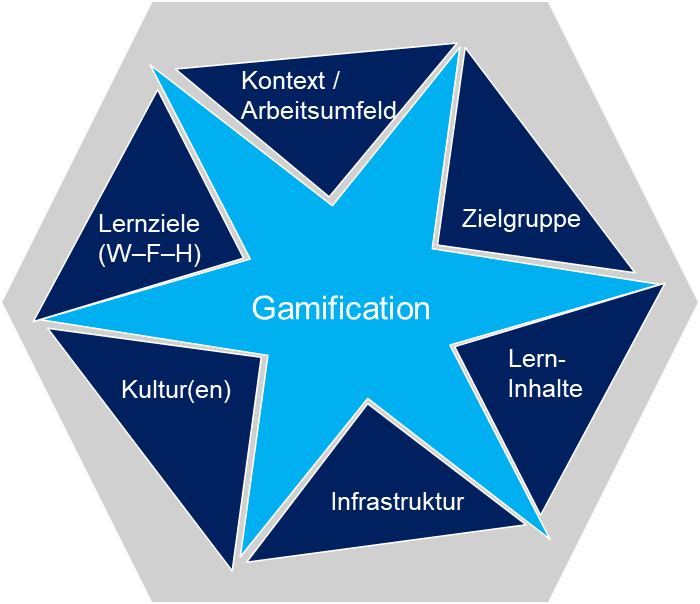 Gamification in learning design refers to a broader principle, namely the fundamental inclusion of playful elements in the learning experience. In a very broad sense, even warm-up and getting to know games as well as “energizers” after a break contribute to the gamification of an event. But it makes little sense to declare every “game” as a gamification. Gamification makes learning spaces more interactive and playful. Learning can become much more effective and sustainable than in classical formats. In order to optimally utilize the potential of gamification, it must be carefully tuned to the intended learning – like a single jigsaw piece that is inserted into a whole puzzle. The learning design has to fit into the framework conditions: For which target group is the measure designed? In which context or working environment does the target group work? What infrastructure is available? And above all: Do the learning contents and the intended learning objectives – knowledge (K), skills (S), attitude (A) – fit in with the elaborated learning design? And does the corporate culture – or in the case of international training courses also the national culture – fit in with the targeted measures? Gamification guru Yu-kai Chou speaks of “motivational design” or “human-focused design” to express the fact that when designing gamification elements, the focus must always be on the human being and his intrinsic motivation. He has identified eight core drivers for this. Use a strong game metaphor. The classic hero’s journey is a possible and proven blueprint for such a metaphor, which can also serve as a red thread for the design of the game idea. Make it easy for players to share their “quest” with others. Create a public sphere and let the participants report on their progress and experiences. Allow social comparison; make it easy for participants to compete with each other and aim for pride.